Initially it was the crevasse between the claim (for which, incidentally, Kenny argued his case strongly) and public opinion that surprised. But the delight arose out of the crafting of the sentence itself. Consider its elements: the chutzpah of the initial concession of the failings and mishaps, which to most people have come to be the whole story; the crisp magisterial tone of 'surely incontestable' to stare down the small boys all too ready to contest; the central claim that this was not merely a good government but the best; the dying fall of the reference to the last seven years; the teasing of 'more than' — might perhaps we consider this government better than that of Mr Howard's latter years? This is a sentence full of defiance, of self-assurance, of disdain for naysayers. To me it evoked the image of a gold braided and bemedalled captain on the bridge, proclaiming the sea-worthiness of his ship, and saluting as the sea rises to meet his nose while the wailings and scrabblings for the lifeboats by lesser mortals die into silence. Such magnificent gestures of defiance are not to be despised. They ennoble politics by reminding us of the fragility of any human endeavour and the ambiguity of human plans, while at the same time embodying the human spark that transcends any political project. They bring us back to what matters. - Diogenes going by daylight with a lantern through Athens in search of a just man. - St Peter wanting to be crucified upside down because he was not worthy to die like his master. - Lawrence asking his executioners to turn him because one side had been adequately cooked. - Thomas More asking the axeman to spare the beard that had done the king no wrong. - The then grandfatherly Colin Cowdrey flown out to face the rampaging Lillee and Thompson. - The young women who put flowers into the guns of tanks sent to intimidate the people. - The aristocratic cardinal who spoke of 'the so-called theologians of the so-called 20th century'. 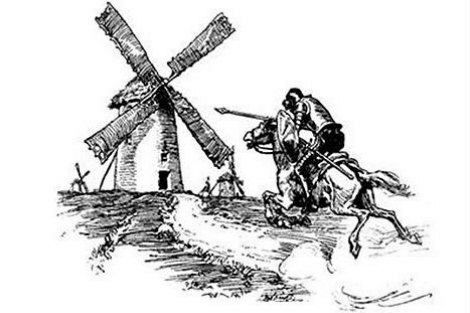 - Don Quixote spurring his donkey on to joust with a windmill. - The king who walked around solemnly with no clothes on. - The man who walked from Melbourne to Sydney, dressed like Napoleon and wheeling a pram. We all have our own lists. The amplitude of such gestures expose the hollowness of ideologies that subordinate personal conscience and freedom to the absolutes of security, identity, economy and public opinion. That is why many of us will celebrate the splendid defiance of public opinion embodied in Kenny's wonderful sentence, but will also dare to contest his thesis. Our problem with the Abbott Government is that it has consistently placed abstractions like border security and economic orthodoxy above the lives of people, and so has been led to devise unfair policies and to act unjustly. It has been a government in grey, one that leaves no space for defiance. From this perspective the toils of the government and of its supporters as they wrestle with an implacable public opinion and the bed of unherdable eels in the Senate may themselves be a source of delight. Their labours, too, compose a gesture that expresses both their common humanity and its triumph over the ideas they conceive and the plans they make. Where would we be without dreams, premonitions, sympathies, signs? We could also spend more time imagining what it's like to be each other, now there's a thought. A delightful piece of writing from a weekend reader of The Australian. And from a columnist of The Australian. You are a cheeky wag Andrew, aren’t you? I love the image of the prime minister as the defiant captain of a sinking ship. How apt! But I must protest at your picture of Don Quixote jousting with the windmill from the back of a donkey. Never! Rocinante may have been an ordinary old nag in a previous life (rocín – field horse, ante – before) but with Don Quixote astride him, he was the noblest warhorse in all the world. An old nag perhaps, but a horse for all that, certainly not a donkey. Still, it is a nice metaphor for Phillip Ruddock, the old warhorse which has outlived its usefulness and is finally sent to the knackery. Unfortunately, the implacable public opinion you mention is only obstinate to some of the government’s economic measures, adjustments to Medicare, university funding, or paid parental leave for example. I think you would be hard pressed to argue that public opinion has any quarrel with its so-called ‘border security’ policies. Pretty nifty sentence crafting on your own part, too, Andy. I especially liked the unherdable eels. I love it. Thanks Andrew, you made my day. Andrew, your comprehensive analysis of Kenny's opening sentence is splendid. But I can't see in it any of the magnanimous individuality that you rightly praise. To me it's just desperate nonsense, a sign that he has sold his soul to News Corp and has to beat round pompously in an attempt to convince himself. Hamilton for Prime Minister. The nimble mind, the elegant insight, the lively wit, the sheer joy of it all deserve a wider platform - is Whitlam's seat still vacant. I have never taken to the badly written prose that passes as poetry in this day and age. But today, Andrew, you have managed to make well written prose look like poetry! Most people that I know read The Australian to have their prejudices confirmed. Those of a conservative bent find food for their soul in the heady sweetness of The Coalition's policies and practices with a dash of acidity provided by squeezing out the bitter mush that is the ALP. The progressives read it to find out what their enemies' cooks are dishing up. Some are even prepared to admit that the ALP gratuitously provides grist for the journalist's mill. I doubt if either side read The Australian for froth and bubble and the occasional chortle. They find that in The Daily Telegraph which in addition to its many photographs has the bonus of a good Form Guide. If only Chris Kenny were more like Sancho Panza! Senor Panza was a bit of a Yodalike character. A sort-of-Zen- Master- by-default, as such people often are. Sadly, he had no effect on the good Don. The blackly humorous bit is that Abbott is like Captain Ahab. He is doomed to sink with all his policies. Chris Kenny, Greg Sheridan & Co will be on shore watching him go down. Jousting at windmills is easier than overcoming prejudices. John Henry Newman wrote that tackling prejudices is like attacking a granite mountain with a razor blade. The deepest prejudices we have, are out-dated traditions to which we bonded as children and have never really questioned. All established religions promote this bonding, and even call it ‘Keeping the Faith’. But ‘by their fruits you will know them.’ And it has led to the deep and often bitter divisions between those who are seeking to ascend God’s Mountain by different paths that are determined by their cultures and degree of development. All this flies in the face of the saying that Bob Hawke reiterated recently, ‘If you believe in the Fatherhood of God, you must accept the brotherhood of mankind.’ We are deeply aware of the prejudices of 'others', but reluctant to recognise or tackle our own. Time to start? Bravo! But for all the laughter evoked by your examples of brave fools, a deep sadness lies in the fact that when such people who believe their own fantasies have a mighty pen to wield, many will take up swords to support them. This makes it difficult to forgive their idiosyncrasies for, regardless of "their common humanity", the poor, the disabled, the ill and all who are now more disadvantaged under the Abbot government, don't feel like chuckling. Here we go again! Fact: 1100 boat people died at sea under Rudd/Gillard. Under the Abbott government, closure of the borders has prevented possibly hundreds of deaths. So much for the "abstraction" of border security costing lives. And: border security an "abstraction"? Tell that to the Italian Defense Minister. According to a leaked document, ISIS is planning to attack Rome via boats: "According to the essay, discovered and translated by the Quilliam Foundation, a US anti-terror think tank, the group intends to “invade” Europe by sending terrorists across the Mediterranean on small boats and skiffs, entering southern Italy much like North African refugees have been doing for years." Hey, ISIS wasn't beheading those Christians on the Libyan shore for purely aesthetic purposes. "will conquer Rome, by Allah’s permission, the promise of our prophet, peace be upon him.” said a voice on the tape of the executions. Oh, but Italy is such a long way away, I guess ... it couldn't happen here under Rudd/Gillard/Rudd/Greens/E.S. - style administration, could it ? methinks that 'Mad as Hell' could call this a 'zinger'?! Here we go again. HH predictably launches yet another barrage of fear mongering and related hyperbole trotted out endlessly by the rat bag hysterics who brought us the Gulf Wars I & II, the Homeland Security siege mentality and the Tea Party. These characters are just as crassly ideological in their spiel, spin and propaganda as the Godless criminal punks racing around the Levant. What they both have in common is oil! Chris Kenny has more than Don Quixote moments, I fear - he appears to be living this part full time. Tony Abbott would be the PM least sensitive to less fortunate humans since federation. A witty and brilliant piece of perversity. It has no regard to the integrity of a group of Federal Ministers who are doing their best to correct the Economic and immoral acts of three immediately prior Federal governments. A Federal Opposition spawned from the residue of the previous three and in denial of its responsibility and its Economic shortfalls. Immoral because it had 2000 children in detention and now supports a report lambasting the current Federal government for only 10% of this figure. The 'public opinion' you quote accepts the 'turn back the bnoats' you abhor. It also objects to findings that at least 80% of the Australians who webt to ISIL/ISIS were on welfare. The consistent abstractions "like border security and economic orthodoxy" cater with more integrity for the lives of people, and the Abbott Government is desperate to devise fair policies and to act justly in the face of Shorten's hypocrisy and obstructionism over vital economic and necessary change. I must admit that I also find it pleasurable reading The Australian - in a masochostic way - and I too find myself going off on mind-bending thought tangents in response to some of the articles. The new tabloid Sydney Morning Herald doesn't seem to do this for me, and I dread the day The Australian stops being published. And HH, - the actions of ISIS are just as Islamic as the actions of Tony Abbott are Christian/Catholic - in name only, but guided by vain ambition. The Prime Minister's choice of Rosie Batty as Australian of the Year is wholly admirable. Her advocacy about domestic violence following the tragic murder of her son by his father has been passionate and effective. But the praise heaped upon Rosie Batty is meaningless, even insulting, while support services are diminishing or disappearing for all the other women and children in need of immediate protection. On Monday, Tony Abbott made his finest speech as prime minister. Yet it was also scare-mongering, heavy handed and intimidatory. It reminded members of the Muslim Community that the Australian Government has the power to control and punish them. It may be a vote winner for a while, but for long term effect it’s worth contrasting it with the British Government’s successful calming messaging during the 1969-97 terror campaign.